• PLOT SUMMARY: "Defiance" - Don't miss the hottest event in comics as BRIGHTEST DAY continues! There can be only one who wields the White Lantern...but is it truly Deadman? And what will happen when he attempts to charge the white ring? Meanwhile, Ronnie Raymond risks everything for Firestorm, Martian Manhunter uncovers more clues about the bizarre string of murders stretching across the country, Aquaman searches for the key to the ocean's survival and the Hawks come face-to-face with the evil that lurks within the strange land known only as Hawkworld! Written by GEOFF JOHNS & PETER J. TOMASI. Art by IVAN REIS, PATRICK GLEASON, ARDIAN SYAF, VICENTE CIFUENTES, REBECCA BUCHMAN & MARK IRWIN. 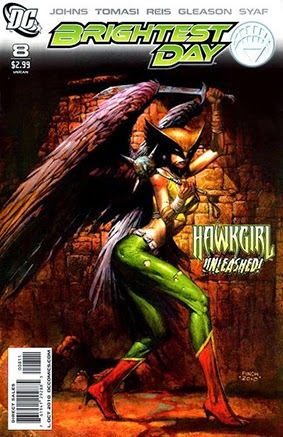 Cover art by David Finch.